Reviewed by Ben Rothke, Times of Israel, Feb. 12, 2017. The Myers–Briggs type indicator is extremely popular, in part that it effortlessly categorizes human personality into 16 categories. Yet as an effective tool for psychological analysis, it’s utterly worthless. Given that the human personality is far too complex to be pigeonholed into its 16 categories. Those with complex and multifaceted personalities are often a challenge to understand. More often than not, they are misunderstood. Perhaps no other rabbinic personality of the last 100 years has been more misunderstood (and often misinterpreted) than the first Ashkenazi chief rabbi of Israel Rabbi Abraham Isaac Kook (1865–1935). 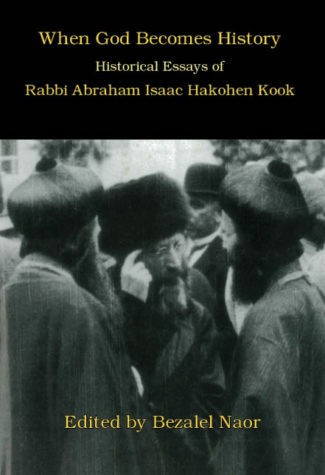 While not a biography per se, When God Becomes History: Historical Essays of Rabbi Abraham Isaac Hakohen Kook (Kodesh Press 0692681698), by Bezalel Naor, a scholar of R’ Kook, achieves what a good biography should: its leaves you with a deeper understanding of the subject. Far too many have portrayed Kook, using the narrow-like lens of Myers-Briggs. Yet Kook deserves to be known as a man of penetratingly deep new ideas about religion, state, and human existence. The letters Naor has collected show a man struggling to be both a faithful religious leader to a flock that didn’t always appreciate or agree with what he said and felt. This is the often intractable challenge that every Chief Rabbi has faced. Naor has gathered 20 of Kook’s essays and letters in this most remarkable and fascinating book. Two of the essays (eulogy for Theodor Herzl and a speech at the groundbreaking of the Hebrew University of Jerusalem) are some Kook’s finest homilies. In the essays, one sees how being misrepresented was extremely difficult for a sensitive soul such as Kook. It troubled him that no matter how selective he chose his words, they would still evoke criticism from, as he called them “the small of intellect”. Throughout the book, Naor captures a recurring theme: Kooks speaks of matters of significance, only to find that his deep words were misunderstood by a shallow body of people. In fact, there lays the problem when it comes to Kook; he often wrote in matters of deep philosophy and universality, which doesn’t always lend itself to the common man. Add to the fact that he lived and preached in a highly charged time, it’s somewhat of a miracle that his words were not misinterpreted. A challenge in reading (and understanding) Kook is his propensity for a focus on universality. It took a man like that of near boundless intellectual capabilities to see how events occurring in his lifetime, were in fact cosmic events in history. It’s ironic that for a man who focused on this cosmic universality, that he was, and still is, simply classified as a simply being nothing more than a Zionistic rabbinic leader. Kook was also a scholar entrenched in kabbalah. In a few of the essays, Naor highlights Kook’s mystical side. For me, I found those rather difficult to understand. As my friend Pesach Sommer noted in his articulate review of the book, R’ Kook, despite being somewhat well known, is the victim of all sorts of assumptions. This is particularly true in the English speaking world. Naor selectively choose from the finest of essays that show Kook as one of the most profound religious leaders of recent times. Kook was misunderstood when he lived, and misunderstood to this very day. But in this superb book, Naor shines some much needed light on Kook, and brings the reader the thoughts of a man who must be understood.